Bernd Becher trained as a painter and illustrator, and first depicted the factories that he and his wife, Hilla, would later photograph in neat and tidy watercolors and lithographs, almost as literal as architects’ renderings or, indeed, photographs. Hilla Becher (who died last October at the age of 81) had already trained and worked as a photographer, and it’s as if by joining forces with her in 1959, Bernd simply found a sharper pencil for recording the local landscape. Can it be that the impulses behind the early sketches and the famous photographs were the same—merely to document, as the couple told interviewers again and again, industrial architecture that was then disappearing from the part of Rhineland Germany where Bernd had grown up? I find myself wondering if his sketches and paintings, pursued for a few decades, might have gone in some unexpected direction, departing from representation entirely. In that scenario, would Hilla’s photographic career also be a surprise? Imagine her as the Louise Bourgeois of photographic expressionism. Obviously not. One of the creations of her and Bernd’s artistic partnership was the seemingly perfect fusion of their visions. “No, there is no division of labor,” they told an interviewer in 1989, in a conversation that pointedly doesn’t designate which of them is speaking. “Outsiders cannot tell who has taken a particular photo and we also often forget ourselves. It simply is not important.” In 1968, Hilla had hinted at a more traditional arrangement, saying that she mainly developed and printed the photographs, while Bernd drove “into the Siegen and Ruhr areas and to Belgium on his ancient motorcycle” to take them. And after Bernd’s death in 2007, Hilla suggested that she had enabled his indifference to everything but their work. For their big retrospective at the Centre Pompidou in 2004, for example, she “hung the images and thought he’d show up for the opening. But he didn’t. He didn’t feel like it.” Most of the time, they granted no public access to the shared space where they conceived their pictures and agreed to continue, for nearly 50 years, to pursue their one method: making large-scale black-and-white portraits of industrial architecture, sorted into “typologies” and arranged into towering grids of six, nine, 12, 15, or 24 photographs. Theirs was the artistic expression of Stanley Cavell’s insight regarding the screwball comedies of remarriage: A successful partnership involves daily reaffirmation of the union, daily agreement that divorce—or some new stylistic departure—is not an option (because divorce, at least, has been for the last hundred years). Many modernists aspired to this unswerving, long-term pursuit of a single style. The paintings of Fernand Léger, Otto Dix, and Edward Hopper (to take three almost at random) seem to distill the traditional expectation that an artistic calling will produce a recognizable manner, and the even tighter focus of later artists like Agnes Martin and Richard Serra has added to the prestige of the unwavering pursuit of one style. This cult of authenticity explains why it can take decades for artists whose approach is more restless, like Gerhard Richter or Sigmar Polke, to emerge from their local settings (in Richter’s case, he was 55 before he had his first small retrospective in the United States); why Philip Guston’s midcareer swerve away from his Abstract Expressionist origins is generally felt to be so heroic; or why the recent tributes to David Bowie lingered, repeatingly, on his allergy to repeating himself: It’s a way of proceeding that’s highly unusual. We talk about young writers finding their “voice” with the assumption that once it is found, it will somehow be intrinsic (note the contradiction!). The notion of a “late style” is the exception that proves the rule, the singular voice coming under the pressure of mortality. With the Bechers, whose work is so coldly “objective” and formally constant—each photograph of a massive industrial structure taken from the same elevated perspective, showing no human figures, shot only in low-contrast daylight (in Alabama they once waited around for three weeks for the weather to cooperate)—it can seem like the decision to stick to this manner is the real item they were so relentlessly working to photograph and then compare to itself, and photograph and compare to itself, in a lifetime-size grid. They often mentioned a quartet of photographers who were important to them: August Sander, Eugène Atget, Walker Evans, and Albert Renger-Patzsch. Hilla said that discovering Sander was “a fantastic revelation” because of how “he portrayed people, in the same way that we would portray objects. Sander encouraged them to perform their role.” People as objects: From their earliest photographs, the Bechers gravitated toward the most anti-Romantic quadrant of modernist photography (though Evans’s inclusion here strikes me as some kind of misunderstanding). Their typologies are carefully, soberly emptied of any social or political implications. Thomas Struth, one of their most successful students, has noted that when the Bechers formulated their cold aesthetic 60 years ago, its apolitical rigor was precisely what lent it political overtones: Germans “didn’t want to look at reality, because what you saw in Germany in the fifties was destruction and the Holocaust. It was all a terrible reality, so precise looking was not a widespread impulse.” But this understanding of the Bechers’ aesthetic, with the implication that in the 1950s and ’60s their photographs represented a reckoning with the past, tends to fall away when you peer at their pictures now in light of their own statements. The Bechers once said, “We want to offer the audience a point of view, or rather a grammar”—note the self-edit toward greater abstraction—in order to “compare the different structures…. To do so, the objects must be isolated from their context and freed from all association.” How different this is from Sander’s series “The Persecuted,” from his People of the Twentieth Century, portraying Jews who were, at best, under threat in 1930s Germany. If he “encouraged them to perform their role,” it was a deeply social and defiantly individual one; in a sense, it was all association. But the Bechers tended to see their heroes as they did their winding towers and blast furnaces: as vessels of formal information, to the exclusion of all else. The Bechers once tried to collaborate with historians—a project that was abandoned because their collaborators intended to “write a text, and garnish their text with our photos,” Bernd recalled in 2002. “They couldn’t imagine that photographs could stand on their own.” And Hilla added: “Working with them, we felt for the first time that we weren’t free.” The most generous interpretation of their refusal to discuss the past (or garnish their photos with texts) is to see it as a formal decision, a theoretical counterpart to the way the images evoke absolute emotional restraint, whether about the photographers’ backgrounds or the objects’ uses. This recalls the lifelong self-erasure of the Japanese painter On Kawara—another late modernist who died quite recently and whose 50-year career of painting nothing but the day’s date, day after day, was married to a reticence about himself that was so total (no interviews, no photographs except from the back, and, like Bernd, routine avoidance of his own openings) that it passes through morbid withdrawal into a kind of sublime expressiveness by dint of its consistency and its departure from common practice. About the same age as the Bechers, On Kawara was a child during Japan’s adventure as an Axis power, a high-school student during the bombings of Hiroshima and Nagasaki. He later said his wartime experiences made him doubt “everything.” Everything—every grain of narrative information, aside from the abstract placeholder of date—is withheld from his pictures in a negative capability that is similar to the little we know about what we see in the Bechers’ photographs. Could this distrust of making assertions be a response to the trauma of growing up in one of the aggressor nations during World War II? Yet other painters of the same generation (I think again of Richter and Polke) discovered themselves precisely by confronting the historical taboos of German culture in the 1960s. If On Kawara carried his doubt to its ultimate conclusion, emptying his canvases of all but code, the Bechers never lost faith in the plain old that-which-can-be-seen. Their unquenchable attraction to industrial forms has a real innocence about it. In 2008, Hilla was asked, “But why furnaces and conveyor belts?” She replied: “Because they are honest. They are functional, and they reflect what they do—that is what we liked. A person always is what s/he wants to be, never what s/he is. Even an animal usually plays a role in front of the camera.” Is there not some innocence, too, in the notion that the massive buildings and equipment of any given industry play no rhetorical role in suggesting the power of their masters? When Hilla is asked whether they “never got bored of blast furnaces, not once in forty years?,” she replies, “Never. We studied this anonymous architecture, object after object, until we understood the enormous variety of the subject…. We learned how blast furnaces worked, how they were constructed, what parts they had.” It seems they were curious only about the mechanics of each structure, a bit like children learning about fire stations. “And then it was easier to find out whether there was a front and back. At some stage we asked ourselves: Does a blast furnace have a face?” But the next question—if so, wouldn’t a blast furnace also “play a role in front of the camera”?—remains unspoken. Although Hilla noted that their photographs were criticized for aestheticizing instruments of injustice or worse, it’s hard to find examples of such challenges in commentaries on their work. Yet it’s an old argument, endemic both to the style and to certain lush forms of photojournalism. In 1931, Walter Benjamin used it against the Bechers’ hero Renger-Patzsch and the machine-age neutrality of his photos, which Benjamin accused of a “posture…that can endow any soup-can with cosmic significance but cannot grasp a single one of the human connections in which it exists.” Susan Sontag and John Berger wrestled with the ethics of war photography and how it beautifies suffering (though stylistic restraint is hardly one of its hallmarks). As in those cases, it tends to be writers who demand that this upstart documentary medium, photography, find a route to moral worth that parallels the way prose achieves it. Silence, though, can prompt speech, and abstraction can draw thought into the unspoken darkrooms of a subject. However shallow the Bechers’ own stated ideas about industrial forms, the images—precisely by their renunciation of narrative—seem to demand the question “What happened here?” The melancholy force of the Bechers’ work has become a critical truism, but the sense of loss you feel studying their photographs is a mourning not so much for each individual demolished object as for prewar optimism itself, all the old beliefs in monumental structures, programs, political solutions. Skepticism about modernizing systems and progressive agendas remains locked in amber in Central Europe, a result of the long (50-year) Second World War. Hilla came of age in that atmosphere, lived through the transition to East Germany, and was already 20 when she fled to the West with her mother. In North America, this kind of political-intellectual austerity—the stoic notion that one had best concentrate on one’s private life and leave questions of civic well-being to the idiot experts, who will foul things up no matter what you do—is less in vogue now than ever, and readers and moviegoers and people who frequent galleries all expect a sense of social engagement to underpin even the most formally exquisite works. It is in this light that the Bechers’ radically neutral vision, so influential to a generation of photographers as well as painters and filmmakers, has acquired its own nostalgic patina. In 2004, Hilla told an interviewer: “I was interested in representing the object precisely, whereby anything, even a face, could be considered an object…. The nineteenth-century stance overflowing with ideas relating to photojournalism…was not my thing.” Their photographs have been exhibited in Ileana Sonnabend’s galleries since 1971 and have been understood at least since then through the lens of conceptual art, so it’s entirely conventional to segregate their body of work from “ideas relating to photojournalism.” The odd thing is how stubbornly those ideas reassert themselves. The Bechers’ earliest photographs were taken in the Ruhr region, which happened to be crucial to Hitler’s war machine (see, for example, the remilitarization of the Rhineland, the Battle of the Ruhr, etc.). As the art historian Kathleen James-Chakraborty notes in Beyond Berlin, a book of essays about Nazi architecture, the Zeche Germania plant that the Bechers photographed in Dortmund in 1971 was built between 1939 and ’44. This fact is included in their own documentation of the image but nowhere that I know of in critical writings on their work. The photographer and writer Ian Wiblin, in the recent volume Camera Constructs, points out that the iron produced by the equipment we see in the Bechers’ Blast Furnace, Hainer Hütte, Siegen, Germany, 1961 could have both supported the German military during World War I and been the product of slave labor during World War II. 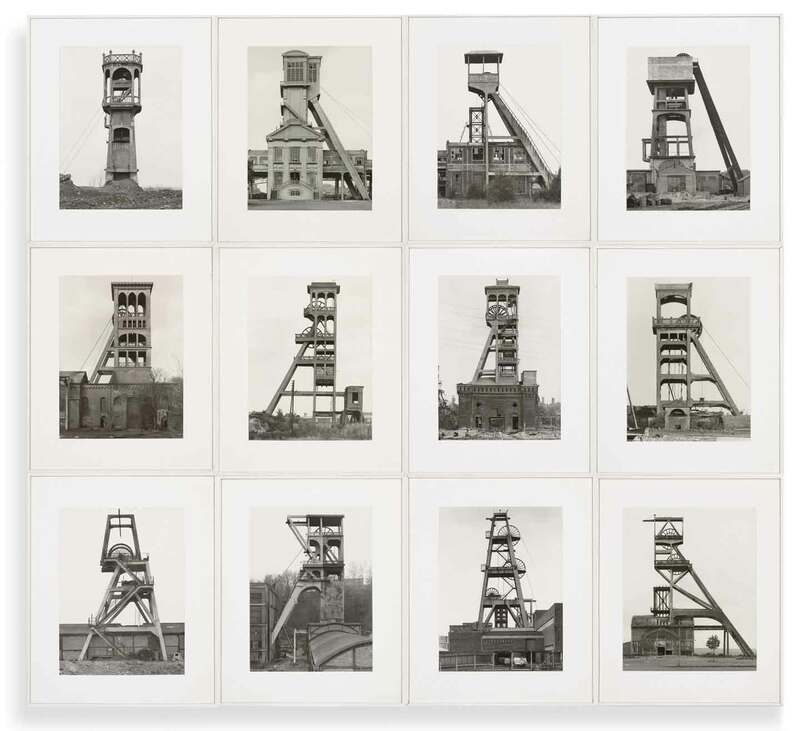 Some of the Bechers’ typologies show structures particular to a given country (such as Winding Towers, Germany, 1972–1983), in which case it may occur to a viewer to ask what all that coal (hauled up via the winding towers) wound up fueling, and when. But visual analogies governing the logic of a grid often nullify any historical distinctions among the photographs. See, for instance, the small-intestinal kinship of Blast Furnaces, Belgium, Germany, France, Luxembourg, 1963–1995. Its wide range of dates and places neutralizes the question of local conditions and histories; function matters only to the extent that it dictates form. The best we have from the Bechers on this point is something Hilla once said: She and Bernd “very quickly agreed on a fundamental conviction, namely that technology does not need to be interpreted, it interprets itself.” Alas, history is different. There is a tension, in the Bechers’ photographs and in their statements, between the urge to document a vanishing industrial landscape and the desire to create a whole new vocabulary of images. It tends to be Bernd who returns to the idea of preservation; he first came to photography for practical reasons, after the industrial architecture near his hometown began to be demolished at a pace that his painting and drawing couldn’t keep up with. He needed a faster technique to preserve his favorite industrial forms. Hilla once explained that “he was plagued by the fear that one day it might disappear and for that reason insisted on photographing it.” A hint of disapproval crept into her tone: “When there was a danger of something disappearing, Bernd always responded intensely, maybe even a little hysterically.” For Bernd, the style of supreme detachment appeared to serve his need for a kind of one-to-one realism, the kind of (magic) realism that quite literally reproduces its subject: “Because this type of world decays,” he said, “what we wished for was not just to illustrate it but somehow to retain it.” This is perilously close to sounding (Hilla might say) like a Romantic impulse. Many people collect stamps, or antiques, or cars. The Bechers chose a subject that was about as massive as the camera, at the time, could encompass, while insisting on a rhetorical approach (visually as well as in interviews) that was modest and mute to an almost perverse degree. This conflict—their refusal to monumentalize objects that are undeniably monumental—is the ethic that their students, among them Thomas Struth, Andreas Gursky, and Candida Höfer, have inherited and further transformed. One thing that Struth and his peers have avoided, though, is the Bechers’ disciplined adherence to a single method of composition. This may be further proof that the discipline itself is the Bechers’ real subject; to borrow their single-mindedness for any new lifelong project would seem too much like copying the masters, the innovators of sameness. It also confirms the ways that photography, as a medium, resists total absorption into the realm of conceptual art: The Bechers took their unvarying vision about as far as it could go. Their heirs seem more interested in creating various sequences of photographs; they privilege the camera’s many subjects rather than any one way of looking at them. Having retreated from the Bechers’ abstracting approach, you could say Struth et al. try out manners of photography that are friendlier to those of us who write about the medium. Their pictures tend to invite summary rather than appearing to silence it.